Thanks to the ongoing release of digital images from University Archives, we are able to visually relive great moments from Columbia’s past. 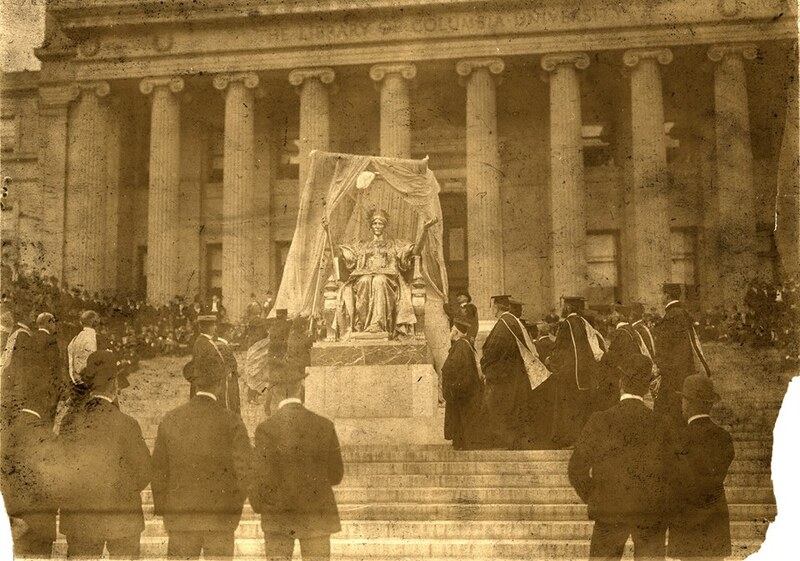 For instance, the image you see here shows the unveiling of the sculpture Alma Mater, which was designed by Daniel Chester French and cast in bronze by John Williams. From the time of its installation, this sculpture has been a symbol of academic pride for Columbia University. The Trustees approved French’s design for the statue in Spring 1901, and it was scheduled to be unveiled at Commencement in June 1903. However, a strike at the Williams foundry delayed completion of the statue. It was therefore officially unveiled in the late afternoon hours on September 23, 1903, following the opening exercises for the 150th academic year, which took place that same day at 3:00 PM. At the unveiling, an introductory prayer was offered by Henry Codman Potter, University Trustee and Bishop of New York. The statue was then formally presented to President Nicholas Murray Butler by John Howard Van Amringe, Dean of Columbia College, on behalf of the donors. Alma Mater was a gift in honor of Robert Goelet of the Class of 1860 from his wife and his son, Robert Walton Goelet. What may not be immediately obvious in the image seen here is that the bronze sculpture was initially gilded and thus glowed like a gold beacon in the sunlight. As taste in sculpture changed, French returned at a later date and removed the gilding, giving the statue the brown lustre it has to this day. For more information about the unveiling of Alma Mater, see the front page of the Columbia Daily Spectator for September 23, 1903, available online through the Columbia Spectator Archive project. 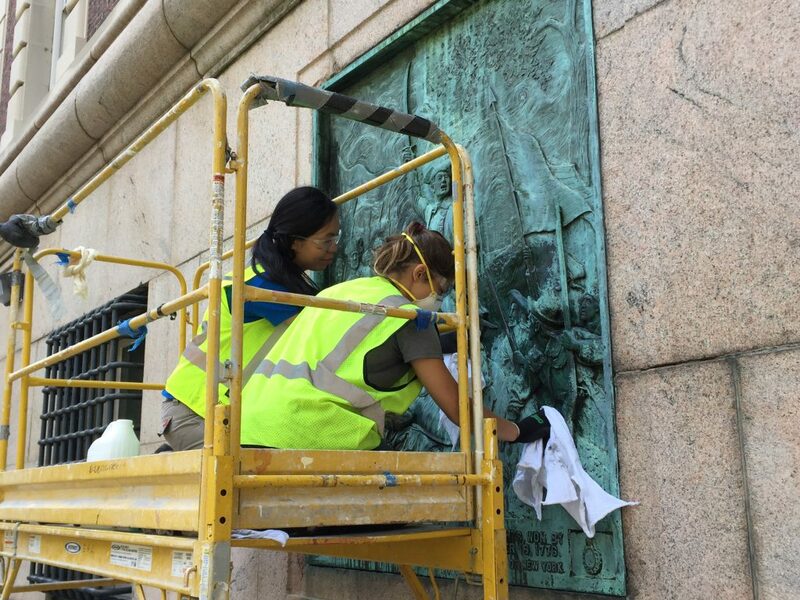 This entry was posted in Morningside and tagged Alma Mater, Daniel Chester French, University Archives on July 15, 2014 by Roberto Ferrari. 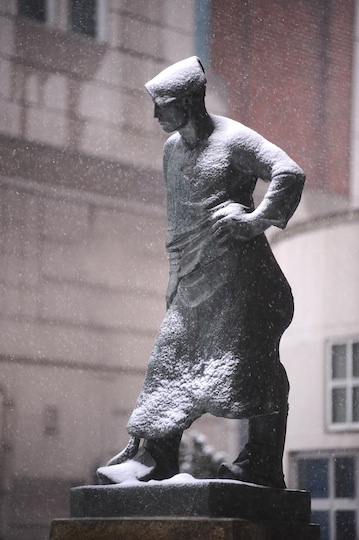 In anticipation of New York’s first snow storm of 2014, here are a few “winter white” pictures of the public sculpture at the Morningside campus. Daniel Chester French, Alma Mater; Constantin Meunier, Le Marteleur; Jacques Lipschitz, Bellerophon Taming Pegasus, and David Bakalar, Life Force. Photographs by Eileen Barroso, Office of Publications, Columbia University. This entry was posted in Morningside and tagged Alma Mater, Bellerophon Taming Pegasus, Constantin Meunier, CU photos, Daniel Chester French, David Bakalar, Jacques Lipschitz, Le Marteleur, Life Force on January 2, 2014 by Roberto Ferrari. 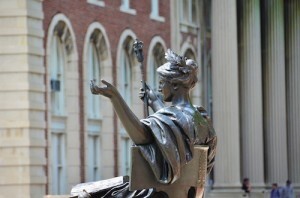 Welcome to the Public Outdoor Sculpture at Columbia blog! Walking around the Morningside Campus, students, faculty, staff, and visitors can see along brick-lined plazas, among verdant trees, and nestled in the lawns a number of large-scale figurative and abstract works in stone, bronze, and steel. These are the public sculptures of Columbia University. There are eighteen free-standing sculptures throughout the Morningside Campus, plus a number of relief plaques in various locations. 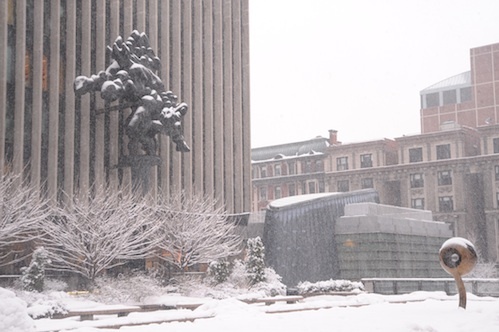 There is also public sculpture at Barnard College and the Lamont-Doherty Earth Observatory. 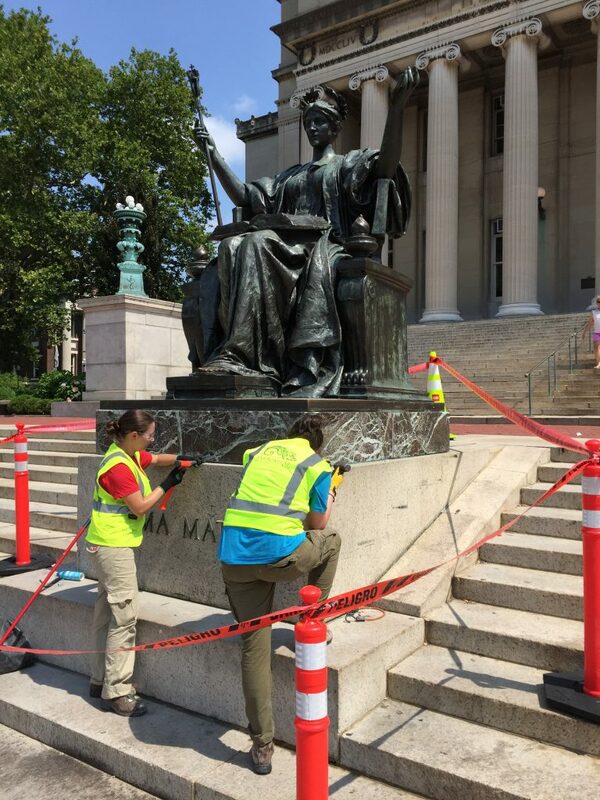 The public outdoor sculpture is overseen by Art Properties, the department responsible for all the art collections of Columbia, based in Avery Architectural & Fine Arts Library. This blog is the place to find out everything you would want to know about these sculptures. Over time we will post historical and current information and images about the public outdoor sculpture. We invite your comments and feedback, and send us your pictures of the sculptures as well by emailing them to artproperties@libraries.cul.columbia.edu. We cannot promise to use every one of them, but those we do use will be made available to the public, although we will be sure to credit you for the photograph. Image Credit: Daniel Chester French, Alma Mater, 1903, bronze, Gift of Mrs. Robert Goelet and Robert Goelet, Jr., in memory of Robert Goelet, Class of 1860 (C00.870). Photograph by Sandy Kaufman, Office of Publications, Columbia University. 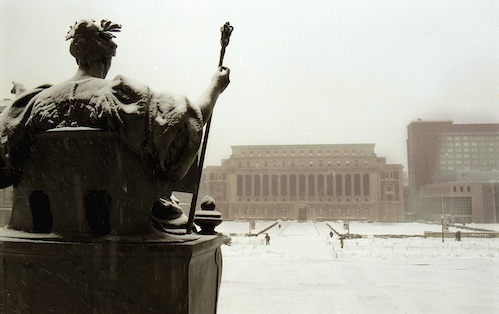 This entry was posted in Morningside and tagged Alma Mater, CU photos, Daniel Chester French, notices on December 30, 2013 by outdoorsculpture.